In the hot months, there’s nothing like a sweet frozen treat to cool you down. Ice cream, popsicles, snow cones, Italian ices… these are some of the favorites. But have you ever heard of shave ice? I tried one this summer and I am hooked! This delicious frozen treat is common in Hawaii, and is therefore sometimes called a Hawaiian shave ice (note, they drop the “d”). But you don’t have to go all the way to Hawaii to get one—you can make them at home with a shaved ice machine. In this article, I’ll get more specific about what a shave ice is, discuss what to look for in a shaved ice machine, and take a look at some of the best options available to buy for home use. Shaved Ice Machines for Anyone! Doshisha is a Japanese manufacturer and this machine is made in Japan. This machine feature a jaunty throwback look but is fully electric. The body is a resin made to look like powder coated steel. This machine has an adjustable blade to control the size of the ice shavings. It also comes with two ice molds to freeze the proper sized cubes to use in the machine. Replacement blades are available from the manufacturer in Japan. The biggest plus of this machine is that it makes truly fluffy, fine shavings, unlike many machines that produce a rougher ice. If you’re looking for that true shaved ice rather than a snow cone feel, this is the right machine for the job. One drawback is that the instructions are in Japanese. Another issue is that it requires 100 volts, whereas most North American outlets are 120 volts. You’d be wise to use an adaptor with this so as to avoid frying the motor. This is technically a snow cone maker, so if it’s true shaved ice you want, this might not be the right machine for you. However, it gets good marks from buyers and seems to be a solid option, so if you’re not overly picky about the consistency of the ice, this is a reasonable choice. 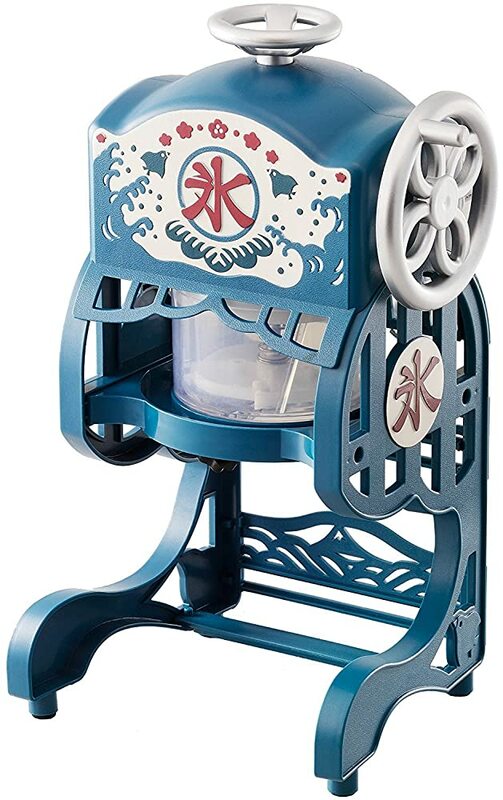 This machine has a cute throwback design, like a miniature snow cone cart. It uses regular ice cubes, which is very convenient, and produces a crunchier, less snow-like shaved ice. 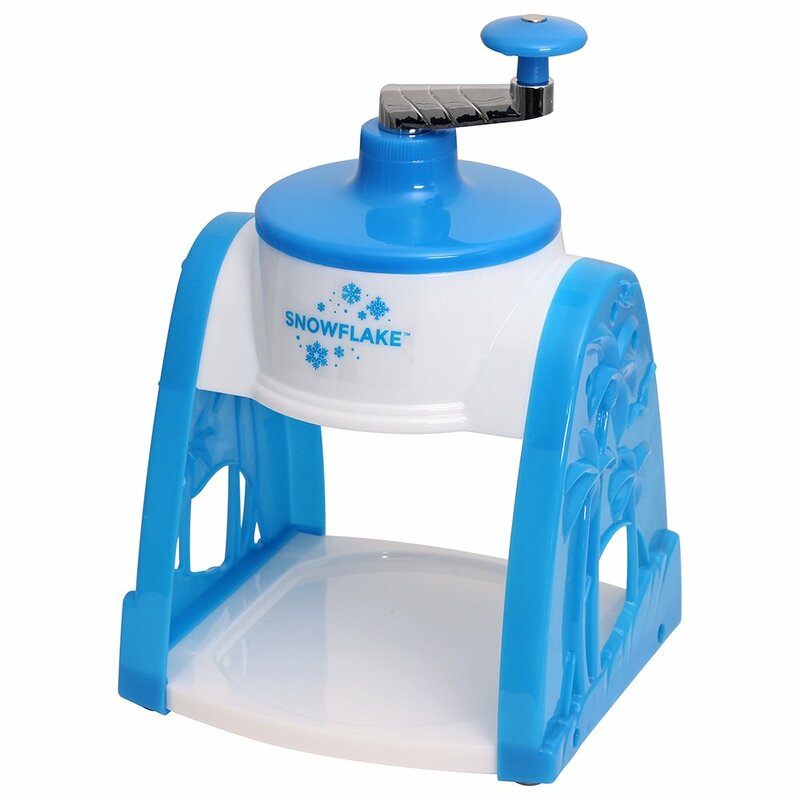 It comes with two plastic snow cone holders, has a little port for holding the snow cones, and has a safety mechanism to keep the blades from running if the top is not secured. Many people love this machine and find it works well and quickly. For a bit more money, you can also get a bundle that includes paper snow cone cups, spoon-straws, 2 types of flavor syrups, and a squeeze bottle. Like many small appliances of this sort, it seems like there’s some inconsistency in the quality of these machines, so be sure to test it out after you receive it. 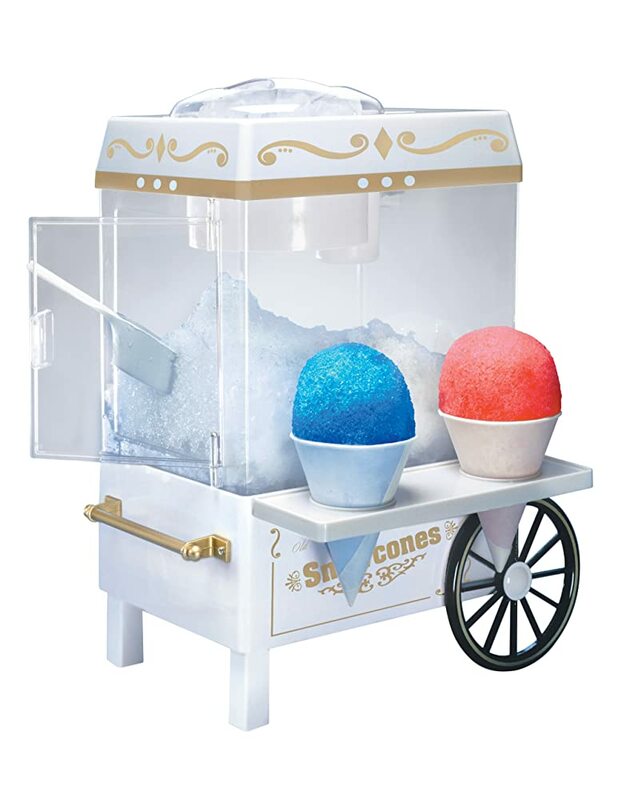 This shaved ice machine is a unique option as it’s manually operated and offers some nice versatility. You can adjust the blades to adjust the size of the ice shavings. It also comes with 3 stackable, lidded molds to make the perfectly shaped ice for the machine, but it can also be used with cubed ice. The portability of a manual machine is also a plus, as is the reduced possibility of parts breaking down. It also comes with a one year warranty. Many people find this machine works wonderfully and is surprisingly easy to use for a manual machine. It’s a nice option for kids to operate (with supervision!). Some people worry about the longevity of the machine due to its plastic construction and flimsy-feeling build quality. The other drawback is that it doesn’t make truly fluffy shaved ice—some people find the final product too rough and crunchy. The Great Northern Popcorn company makes a number of concession-type machines. If you’re planning to make a lot of shaved ice on a regular basis or you’re thinking of sharing the cost with another family, the Great Northern shaved ice machine is the ultimate splurge. 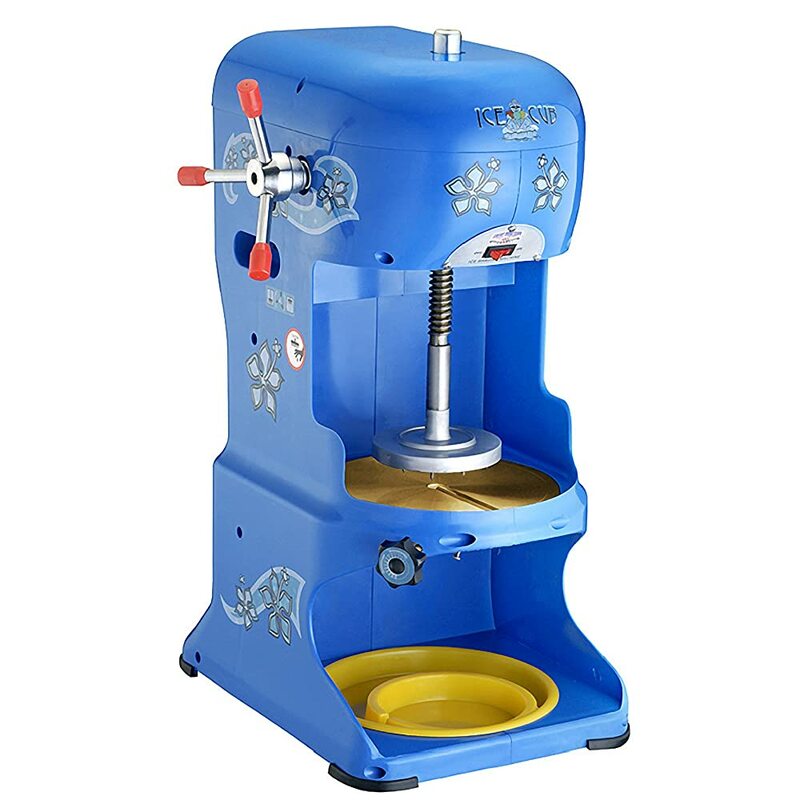 This machine features a fully metal—brass and stainless steel—body for excellent durability. As a commercial machine, it boasts of the ability to shave through 350 pounds of ice per hour! Replacement blades are available. Many people find this makes wonderful shaved ice—truly fluffy and not too crunchy! Its ability to get through such a large amount of ice makes it well suited to large parties and light commercial use (I can imagine a great “lemonade stand” business with this!). One drawback, in addition to the price tag, is that you have to freeze your own large blocks of ice. It is also on the bulky side and requires a lot of storage space. 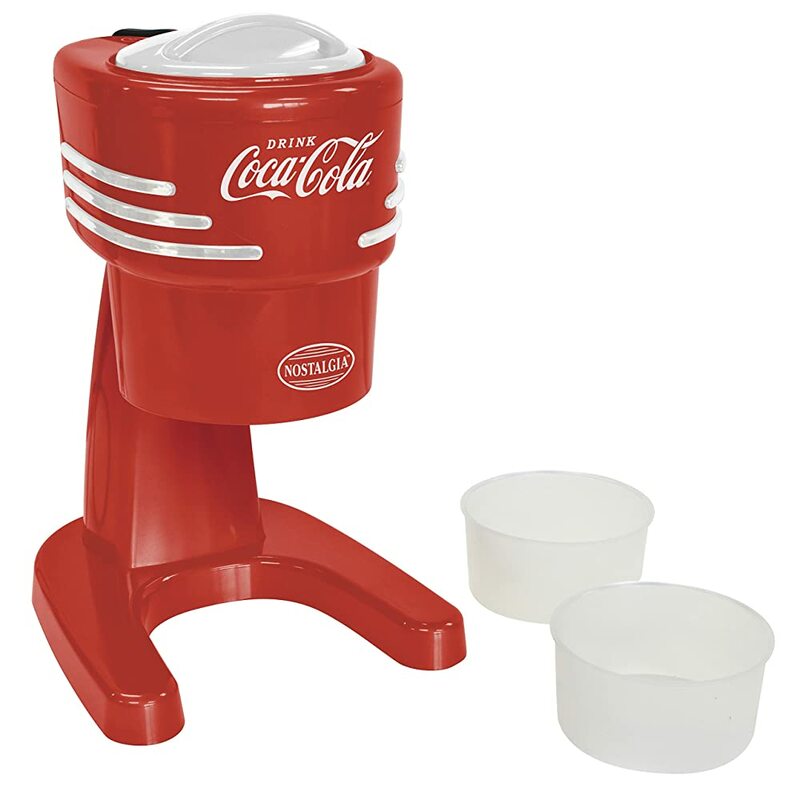 This shaved ice machine is decorated with a Coca-cola theme for the collector type, or anyone who wants a fun throwback look. It has a plastic body and suctions to the work surface for stability. Like many of the shaved ice machines, this one comes with a dedicated bowl for freezing a proper sized chunk of ice. You can also use cubed ice with this machine although some users found that this creates rougher shaved ice. Many people praise the consistency of ice this machine makes, reporting that it makes truly fluffy shaved ice. Some have had the machine for a few years with good success. However, it seems like there might be some quality issues. Some people have had bad luck with the motor giving out or not working properly from the start, so it’s best to give it a whirl before the return period runs out! Hawaiian Shaved Ice is the company that wants to bring shave ices into your home! Their website has a ton of information about how to perfect your shave ice technique. This machine (S900) is frequently recommended on blogs and websites discussing shave ice machines for home use. It comes with a no-slip matt and two ice molds for optimal use, but you can also use cubes to make a coarser shave ice. Interestingly, you control the texture of the ice by pressing down on the top of the machine when the machine is in motion. 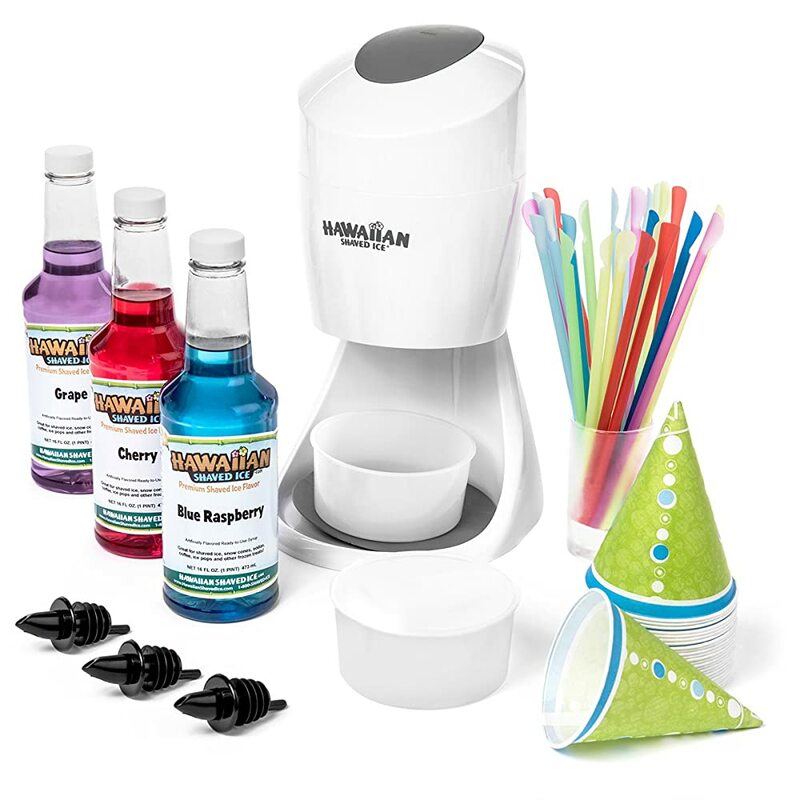 This party package also comes with 3 different syrups (cherry, grape, and blue raspberry), 25 cone cups, 25 spoon straws, and 3 bottle spouts. Many people love this machine because it makes truly fluffy shaved ice. People also really like the flavors that come with the party package and find them more authentic than what you typically find. The biggest complaint, though, is that the machine tends to break down pretty quickly for some people. It seems that the motor lacks integrity, which is quite common for small machines like this that do a big job! A shave ice is very similar to a snow cone. A machine (or person—it can be done manually!) shaves a chunk or pieces of ice into a ball of fluffy ice to which you apply the tasty flavoring of your choice. I already mentioned Hawaii, and this treat is also quite popular in Japan—it’s called kakigori there! The main difference between a snow cone and shave ice is the texture. Snow cones are small chopped up little bits of ice that crunch as you eat it. Shaved ice, on the other hand, has a much finer, fluffier texture that resembles snow. Rather than letting the flavoring down to the bottom of the container, the shaved ice holds the flavouring more uniformly through the container, so each bite has a similar flavor. This was my favorite aspect of the shave ice, as I often find snow cones bland on the top and too sweet on the bottom. When you go to a specialty shaved ice store, you’ll see a much wider variety of flavors than are usually available for snow cones, and even a variety of toppings. At home, don’t be a afraid to get creative with your shave ice! There are two main types of shaved ice machines: block shavers and cube shavers. Block shavers are common for commercial use. They require a large block of clear ice and could be a bit cumbersome to use at home. Cube shavers offer more convenience for home use as you can use the cubes your ice cube trays make, or store bought bagged ice. Alternatively, some shaved ice machines come with a mold that freezes the ice into the shape suited to the machine. Most shaved ice machines for home use are made with fairly inexpensive components such as plastic for the housing of the machine. Some machines have metal housings, which would last longer. Shaving ice is a heavy duty business. Parts, especially the blades, can easily wear down, so if you have the option to easily replace these parts, your machine will last a lot longer! Because these machines have a lot of moving parts and motors, a good warranty is a big bonus in case something goes wrong with the machine. Chances are, this is not a machine you will keep out on your counter for daily use, so consider your storage space when looking at machines. Do you Need a Shaved Ice Machine? Commercial shavers can be pricey, but many of the shaved ice machines available for home use are very reasonably priced. This can become a new family favourite treat. I think it’d also be a great purchase to share with friends to have for special occasions like holidays and birthday parties or to use at the cottage throughout the summer. Start Shaving Up Some Sweet & Cool Treats! If you haven’t yet had a shave ice, I highly recommend you try it! And once you’re hooked, I recommend the Doshisha Electric Fluffy Ice Maker so you can make your own shave ice treats at home. It’ll give you that truly fluffy shaved ice that is a major step above your average snow cone. I like that it comes with the necessary molds to make the perfect ice chunk for shaving. It has a fun design, isn’t too big, and ultimately does a good job of what is a tough task! It’s also useful that the company specifically states you can get replacement blades, which will increase the longevity of the machine. Have you ever had a shave ice? What’s your favorite flavor?